We’ve all clicked links that lead to an error page. We click a link because it’s something we’re interested in, so getting an error page is always disappointing. And what do you do when you’re greeted with a “Sorry, this page wasn’t found” message? Usually we just click away and move on. You don’t have to lose visitors though! Set up a better 404 page, so you can keep visitors around for longer and turn the disappointment into a better experience. It’s called a 404 page because that’s the status code the site sends to your browser. You can create a custom 404 error page by coding it into your child theme. But I know you’d really rather not have to do anything with code. And you don’t have to! 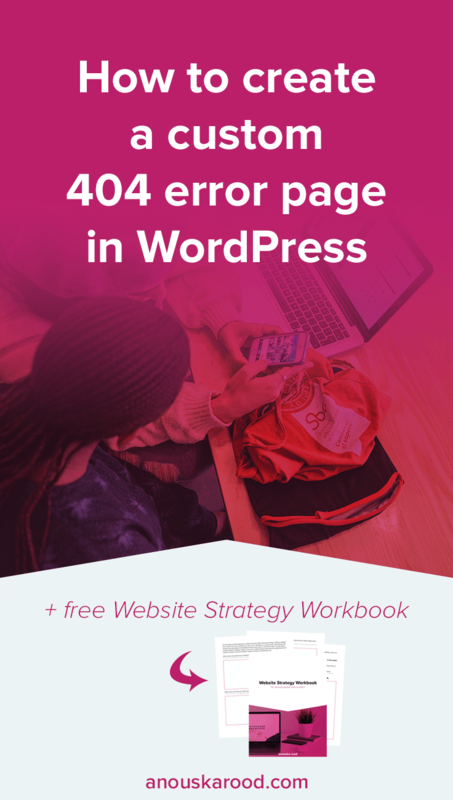 You can create your custom 404 page like any other page, and use the 404page plugin to set that page to be used as your custom 404 error page. Typically, you get a short message that the page doesn’t exist and a search bar to find what you were looking for. That’s pretty disappointing and you usually click away and move on. You wouldn’t be the only one with such a message on your site, even some well-known online entrepreneurs have a similar message. This is the message you get when you get a 404 error on Melyssa Griffin’s site. She includes a list of pages, categories, authors, monthly archive, and her 100 most recent posts. It’s good that they have a search box to find what you’re looking for, but listing all your pages and posts, especially when you have so many, is seriously overwhelming and unlikely to actually keep people around. Start your custom 404 page with a friendly message that the page wasn’t found. Don’t use words that could be considered blaming the visitor like Amy Porterfield‘s message below. “You’ve taken a wrong turn” can be interpreted by a visitor that it’s their fault for ending up here. Instead, let your visitors know it isn’t their fault and tell them you’re sorry for disappointing them. You can turn the disappointment into a great experience, by giving away something for free. Amy does that by sending you to her freebies page. It’s even better when you don’t ask for their email address. Leaving someone with a positive experience instead of a negative one is totally worth not getting one email address. 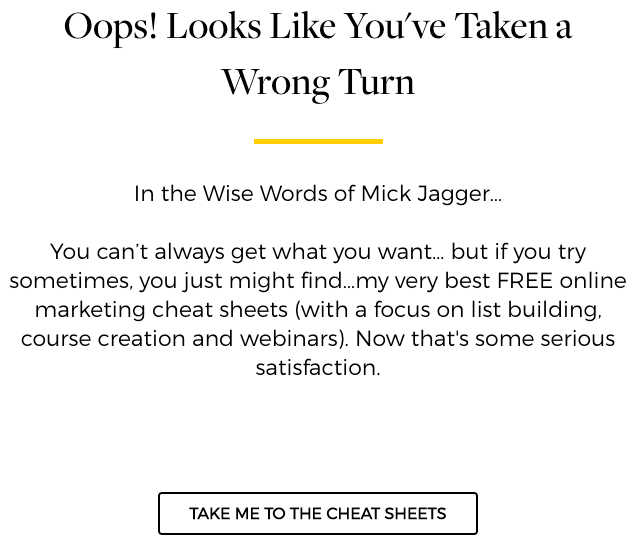 Make it a strategic freebie that ties into your usual content and services. If the 404 freebie is useful to them, they might just sign up for your other freebies. They’re definitely more likely to stick around and read your posts. Apart from the friendly message and freebie, include a search bar so people can try to find what they came for. Don’t list ALL your pages and posts. If you do add links to pages, make sure to only list the most important ones. Those should already be in your main navigation though, and your 404 page should have the regular navigation of your site so it might not be necessary to add links to pages at all. A better way to keep visitors around and reading, is to add links to just a few of your most popular posts. Don’t overwhelm them with a list of all your posts or even your 100 most recent posts. Limit it to 3 or 4 posts. As you see, you can get strategic even with the page you hope nobody sees. 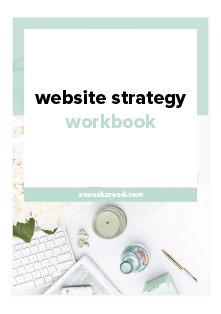 Sign up below for my free Website Strategy Workbook to create a strategy for your entire site.